What a fitting end to a long hard season with another successful event covered. 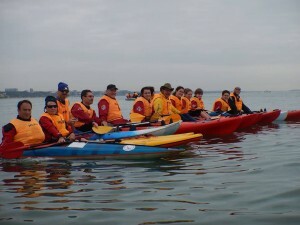 Once again a big thank you to all the paddlers, foot patrols and boat crews for covering the Human Race Poole Swim at Sandbanks on Sat 27th Sept.
Over 400 swimmers took to the water and were very pleased to be in the safe hands of RLSS Poole Lifeguard. We would like to give a special thank you to Boscombe Lifeguards and Branksome SLSC for all your support with not only this event, but for your support throughout the year. Just a short note to thank you and all of your superb water safety crew for their efforts this Saturday. It was a terrific event that ran so smoothly, thanks to their professionalism and enthusiasm. I am also grateful to you for all your help and advice in the lead up to Saturday. The feedback from competitors has been universally positive. I look forward to working with you on next years event. Once again, thanks.